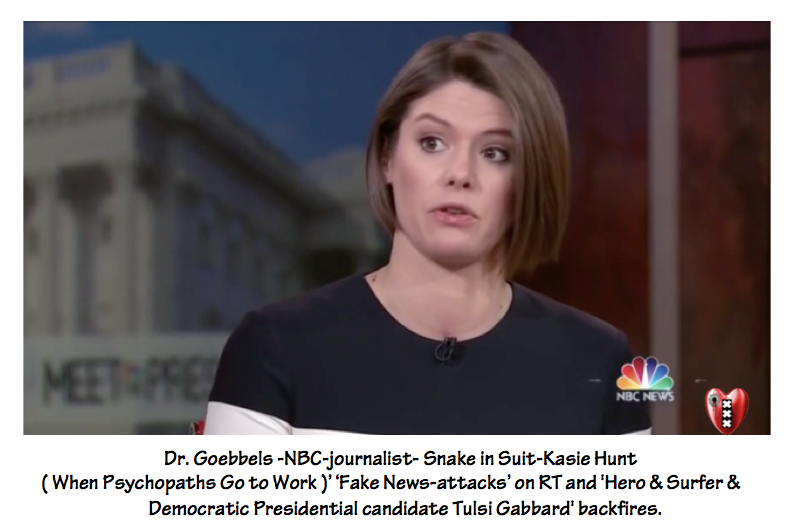 Dr. Goebbels NBC-Fake-News’ and their Capitol Hill correspondent ‘Snake in Suit Hunt’ claimed that on of the rare not corrupt Democratic Presidential candidate ‘Hero &Srufer Tulsi Gabbard’ was being supported by a “Russian machine” (RT). The ‘dr. Goebbels- attack’ backfired after critics pointed out that ‘dr. Goebbbesl-NBC’ from corporate crime cited the Democrat-run disinformation operation New Knowledge. RT’s Dan Cohen’, reporter behind the ‘Fake News – Gabbard -story’ that has since been attacked by ‘Fake News-Snake in Suit- Hunt'(When Psychopaths Go to Work), sits down with Manila Chan to discuss the credibility of ‘dr. Goebbels-NBC’. Investigative journalist Ben Swann joins the discussion about the ‘Fake- News- attacks ‘waged against RT, the state of corporate crime journalism in America and ‘The State – dr. Goebbels- journalism’ from BBC and the NOS in the EU and Tulsi Gabbard’s foreign policy reputation. Tulsi Gabbard’s Presidential Campaign to Challenge ‘US-Killer-Elite-Military-Industrial Complex’(Video) with Puppets Trump&.Clintons&Obama(Video), etc. ‘Rusland Hysterie –dag’ bij de Staats BBC& NOS: Armen gaan 9 jaar eerder dood dan de Rijken en daar komt geen Rus aan te pas(Video) !